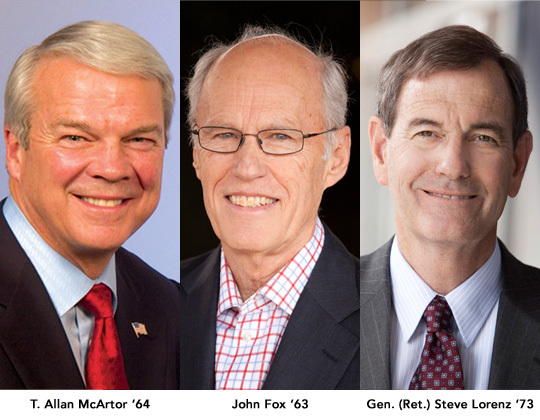 The United States Air Force Academy and the Association of Graduates are proud to announce the Distinguished Graduate honorees for 2017. John Fox (Class of 1963) of Denver, Colorado; T. Allan McArtor (Class of 1964) of Great Falls, Virginia; and Gen. (Ret.) Steve Lorenz (Class of 1973) of Monument, Colorado, are this year’s honorees. They join 34 fellow Academy graduates who have previously been honored as distinguished graduates. After serving his nation as an Air Force pilot and instructor, Fox would move on to a long career in the oil, natural gas and energy business. He founded Western Gas Resources, Inc., and served as its executive vice president and chief operating officer for 15 years. He would then co-found MarkWest Energy Partners and served as president/CEO and board chairman from 1987 to retirement in 2009. Fox is currently chairman of the board of Kona Mountain Coffee, a Hawaii-based coffee firm. He is a founding director and former vice chairman of the United States Air Force Academy Endowment. He has been a key supporter of the Academy’s new Center for Character and Leadership Development, as well as the Academy Research and Development Institute. McArtor is chairman and chief operating officer of Airbus Group. He was previously a senior manager with Federal Express Corporation. From 1987-89, McArtor served as the administrator of the Federal Aviation Administration. A fighter pilot during the Vietnam War, McArtor would later fly for the Air Force’s Thunderbirds Aerial Demonstration Team prior to beginning his civilian career. Today, he serves on the Board of Directors of the Air Force Academy Athletic Corporation and is a 30-year trustee of the Falcon Foundation. Lorenz enjoyed a 37-year Air Force career that culminated in his being commander of Air Education and Training Command. Earlier military assignments included commands at the squadron, group, wing and major command levels, as well as time as the commandant of cadets at the Academy. Six days after the Sept. 11, 2001 terrorist attacks, Lorenz assumed the role of Air Force Director of the Budget. For four years, he and his team would manage an annual budget of about $100 billion. After retirement, Lorenz served four years as president and CEO of the USAFA Endowment, guiding the organization to significant milestones along the way and helping raise more than $80 million for Academy building projects and programs during his tenure. The Academy and AOG have selected between two and four Distinguished Graduates per year since 2001. The award recognizes alumni who have set themselves apart by making significant contributions to our nation and their communities. The Founders Day dinner and Distinguished Graduate Award ceremony will take place on Friday, April 6, 2018. Registration will open mid-January at www.usafa.org.